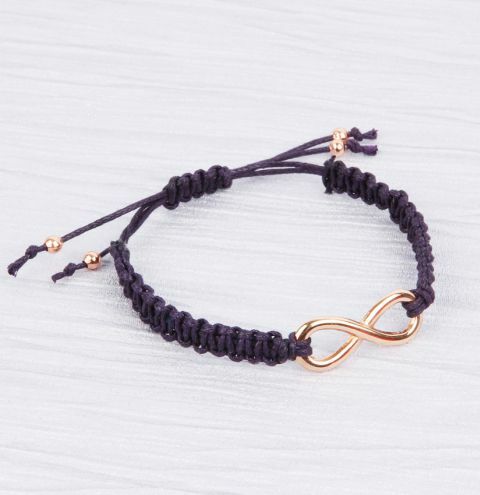 Make a simple square knotMacramé bracelet using with a trending rose gold infinity connector! Your components will be able to make TWO bracelets. Cut 2 x 30cm length strands and 2 x 1 meter length strands. Thread the 20cm length of cord through a hole on your charm to its halfway point and thread the other 20cm length through the other side of the charm to the halfway point. Choose one side of your charm and secure those threads to a work surface so that the cords stay taught. Bring the two threads together as they will act as one thread running through the centre of the knots. Thread one of your longer lengths of thread under both the cords to the halfway point. Tie a normal overhand knot at the base of the 20cm thread close to the charm. Start your macrame knotting by following these images. - Take your right hand cord and pass it over the middle two cords. - Next, take your left hand cord and place it over the right cord. Move the left cord under the centre cord and up through the middle of the loop on the right side. - Pull the threads to finish one half of your knot. - Repeat this process on the opposite side by starting by crossing the left hand cord over the middle cords. Create approx. 2" of knotted cord. Repeat this on the other side of your charm. Take the 4 ends of the centre cords, lay them side by side and then do a macramé braid (approx. 6 or 7 square knots) for your sliding knot. Secure the ends with a drop of glue, being careful not to glue the sliding knot to the centre cords running through it (otherwise it will not be able to slide and adjust). Try gently pulling the centre cords through the sliding knot while the glue dries. Trim the ends so the sliding knot is neat. Thread a bead onto each thread and knot to keep them in place.